Zemu Glacier is a 26 km long glacier draining the east side of Kanchenjunga the world’s third highest mountain. The importance of the glacier is that it is a key water source for the Teetsa River. The glacier acts as a natural reservoir releasing water due to melting. The Teetsa River is the focus of a hydropower development project being undertaken by the Government of Sikkim. To date 510 mw of the proposed 3500 mw potential are operating. This is a run of the river project, with the water extracted from the river without a dam, run along the valley wall and dropped back to the river through a series of turbines. Run of river is much less expensive than a dam in this remote, earthquake prone, mountainous valley. Zemu Glacier has received little attention, and hence we will have to rely on Digital Globe imagery to observe its changes. The glacier has been observed to retreat at 27 m per year from 1967-1984. Given the length of the glacier the retreat was fairly slow. The glacier has a heavy debris cover on most of its length, insulating it from ablation, and leading to know detectable retreat of the main terminus from 2000 to 2013 Basnett et al (2013). 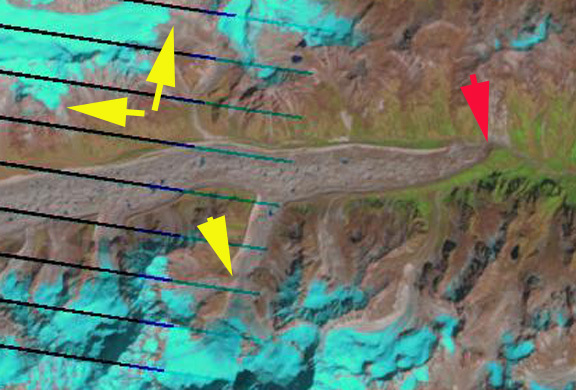 A view of the lower glacier indicates this heavy debris cover, with some scattered small glacial lakes on its surface. The newly devegetated zone beyond retreating glaciers is small, indicating the slow retreat. Thinning has been significant. The lateral moraine ridges on either side of the main glacier average 150 feet above the main glacier surface. These were built during the Little Ice Age advance. Lateral moraines do not reach above the glacier surface that built them. Thus, the lower glacier has thinned by approximately 150 feet in the last century or so. A view of a portion of the upper glacier indicates one issue for the glacier. Several of the tributaries no longer join the Zemu, depriving it of a portion of a portion of its former accumulation sources. Near the head of the glacier the walls of Kanchenjunga delivers the debris and large amounts of snow in the form of avalanches to the glacier basin at 5900 to 5200 m. The lower 18 km of the glacier is in the ablation zone where melt dominates. 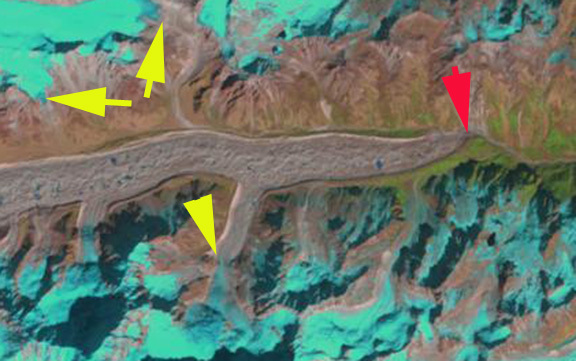 A comparison of 2000 and 2013 Landsat images indicates the lack of change in location of main terminus, red arrows, but recession of surrounding glaciers in the Zemu Basin, yellow arrows. This area from 5200 m to the 4200 m terminus would quickly melt away without the natural debris cover. The glacier receives considerable snow input from up to 8000 m via avalanches, which are deposited in this region between 5200 m and 5900 m. This glacier will continue to be a large water source for the Teetsa River for the foreseeable future. The glacier has not been retreating as fast or developing a proglacial lake as has happened to Southh Lhonak Glacier, Middle Lhonak Glacier and Changsang Glacier to the north, this should be anticipated in the near future. This entry was posted in Uncategorized and tagged glacier climate change, global warming, hydropower, retreat, Sikkim Glacier. Bookmark the permalink.